Professional graphics cards are not really similar to consumer GPUs the like of GTX 980Ti or the Fury X and so forth. These are machines that share more with CPUs in their ability to work in networks and data racks than individual machines and are sturdier, more reliable pieces of technology than their fancy little sisters while also packing a lot more TFLOPS. In this regard, AMD announced its newest professional graphics card, the FirePro S9170. 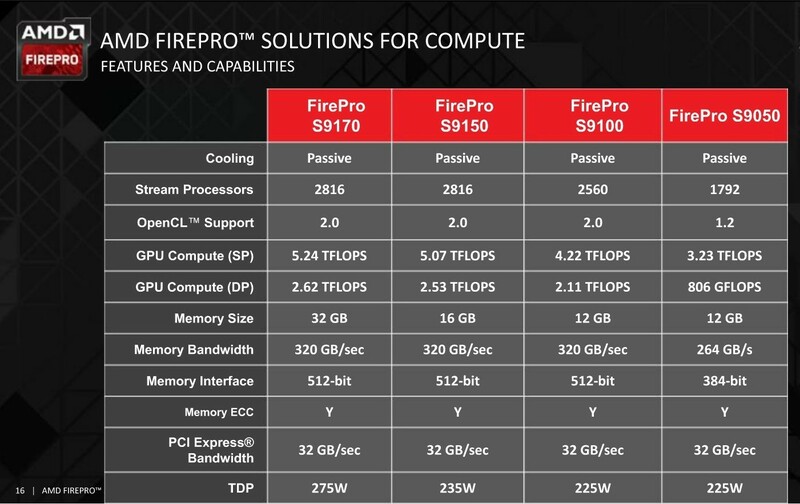 Its main addition compared to the existing S9150 is its slight increase of single precision TFLOPS from 5.07 to 5.24 and most obviously the increase of available memory from 16GB GDDR5 to 32GB. Designed for intensive workloads in terms of pure calculation, the new card aims to become ominous in data centers of government agencies, universities and private companies that specialize in industrial design or 3D modeling. The 32GB of memory is the largest available on a single GPU and will enable the acceleration of scientific calculations that were previously thought impossible. The latest large OpenCL codes require large space on a single graphics card to operate properly, and the size and the available TFLOPS helps running programs much faster than storing them on DRAM or on HDDs. The new card also operates with 10% less energy than its predecessors, having 275W DTP, with an option of 235W, and with 40% better double precision performance while having a dual slot form factor and passive cooling. 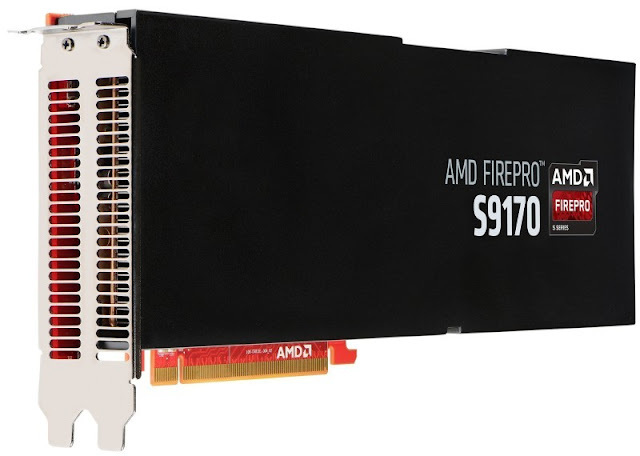 The S9170 is, in fact, a larger, more powerful S9150 that had good merits of its own, managing to sustain 2TFLOPS of sustained DGEMM performance. The GPU is meant to accelerate applications by offloading compute-intensive tasks from the CPU, while the CPU continues to run the rest of the code. Asked on why the new S9170 doesn't use HBM memory instead of GDDR5, Niles Burbank, the senior product manager at AMD, said that "GDDR5 memory modules are more reliable for heavy-duty computing and load-sharing than the new HBM memory chips presently found on the Radeon R9 Fury X." Although he may be right, it still shows how experimental the new HBM memory racks still are, and why AMD still goes for the good old GDDR5 when having to build industrial-grade failsafe graphics solutions. Although we don't have an exact price, it's expected to see the new FirePro S9170 at around $4000 (€3 625) street price.